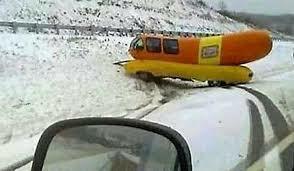 I will say the one picture that inevitably ends up on my wall every year is one where the Wienermobile has plowed into the side of the road in a snowstorm. That picture is from 2008 and someone just posted it on my wall a few days ago. In fact, it’s a running joke among former Hotdoggers that as soon as winter hits, out will come this old picture on all of our walls. It’s fine. My friends don’t know and it’s sweet that they thought of me. But there are some messages that I just don’t understand. I have a friend who sent me a random DM yesterday and in an effort to not call this person out, I’ll just say that I didn’t get it. I wasn’t sure if he was sending it to me because I’m Jewish or what. It wasn’t offensive. It just didn’t make sense. I’m a nice person and I always feel compelled to respond to people. I don’t like it when people ignore me, so I try to treat others with kindness and respond to them, but I couldn’t even muster a thank you. It wasn’t worth getting into any kind of discussion about this message, so I decided to say no to responding. I didn’t even question it and let me tell you, it felt good. I don’t feel guilty about it for a second. Do you feel like you respond to every message you get or are you okay sending a silent signal to the person that you’re not interested by not responding? Do you have a hard time saying no? Tell me below and if you like what you’ve read, please subscribe below. Thanks!